Home » Rocky Point Times » Medical Tourism the Next Big Thing for Rocky Point? Medical Tourism the Next Big Thing for Rocky Point? Medical entrepreneurs toured the city of Puerto Peñasco this week. On their agenda was finding support for a clinic designed to tap into the market for high end medical services. According to a recent study, ‘Medical Tourism’ is expected to grow by 25% over the next 10 years. Traveling to another country for treatment is usually based on finding better prices, or procedures that are not available at home. Dr. Wu Chul Moon of Korea, and Dr. Javier Magrina of the Mayo Clinic, met with various members of the Rocky Point business community. They explained their vision for providing care, and why Peñasco makes a great destination. Dr. Moon is a specialist in cancer research, and has a number of patents for original treatment technologies and protocols. His long affiliation with the Mayo Clinic brought him in contact with Dr. Magrina. Dr. Moon’s innovative anti-cancer treatments were discussed, as well as anti-aging and aesthetic surgery options. The Physicians feel that Rocky Point has the potential to become, like Rochester Minnesota and the Mayo Clinic, a destination for those seeking the highest standard of medical treatment. It was mentioned that families tend to travel with patients seeking many of these treatment services. Rocky Point is a natural location to accommodate extended stays in a beautiful setting. 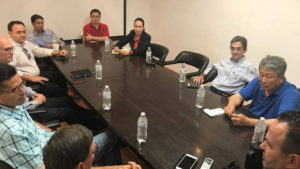 In meetings arranged by the cities Director of Economic Development, Jorge Valdes, the doctors sought out insight from the local community, as well as support for the future project. Topics discussed included using existing facilities to ‘start small’, and the investment for needed equipment. The concept of a development where families could own housing, and maintain a stem cell bank was also discussed.